You’ve probably “Boosted” the posts on your Facebook page before and you’ve found the results to be less than impressive. There is a whole other side to Facebook advertising that you’ve probably never heard about and that side is a bit trickier than just pressing “Boost Post”. A successful Facebook Ad campaign requires in-depth research and proper planning to drive results. Want to speak to someone that can do it for you? 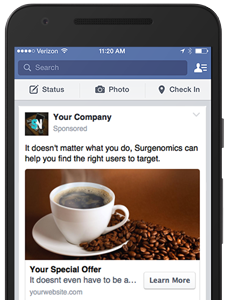 Advertising on Facebook a great option for local businesses who are looking for less expensive online marketing alternatives. From a cost point of view, advertising on Facebook is a cheaper alternative. Think of it this way, when advertising on Google the user is coming to you whereas on Facebook you are going to the user. Facebook ad campaigns can be optimized to make sure that only the users you want to see them will see it.it will be seen by the right people at the right time, and with the right images and messages. By advertising on a social media platform, you are reaching users in their spare time. This means they are more likely to notice your advertisement and since they will be interested in what we are showing them, they will most likely visit your website to find out more information.